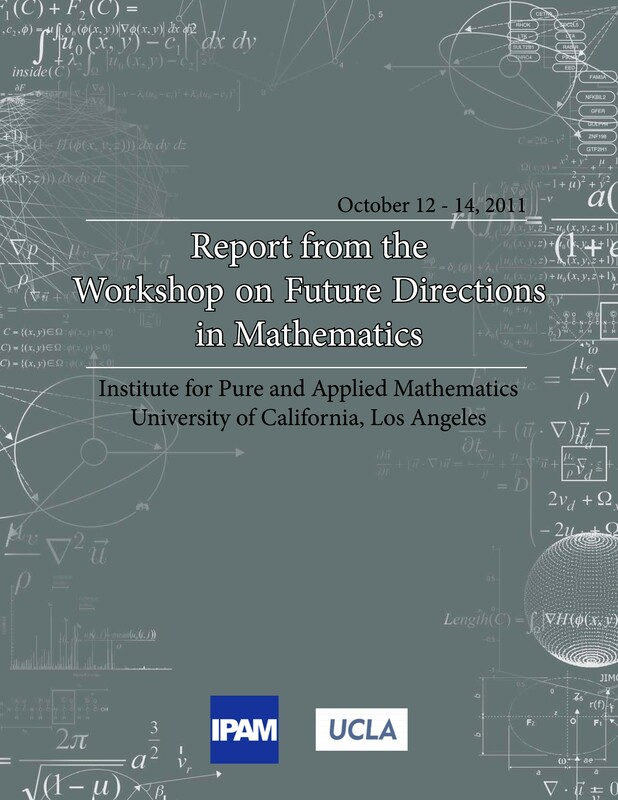 This report summarizes the Workshop on Future Directions in Mathematics, sponsored by the Office of the Assistant Secretary of Defense for Research and Engineering (ASD(R&E)), Basic Science Office. The workshop was held at the Institute for Pure and Applied Mathematics (IPAM) at UCLA on October 12-14, 2011. It involved 23 invited scientists and 4 government observers. Read the full report. The goals of the workshop were to provide input to the ASD(R&E) on the current state of mathematics research, the most promising directions for future research in mathematics, the infrastructure needed to support that future research, and a comparison of mathematics in the US and in the rest of the world. These goals were articulated through a set of six questions, listed in Appendix II, that were sent to the participants prior to the workshop. The invited mathematical scientists came from universities and industrial labs, and included mathematicians, statisticians, computer scientists, electrical engineers and mechanical engineers. This group consisted of established leaders in various fields of mathematics, and brilliant young researchers representing recent breakthroughs and future directions. Within this report, the terms “mathematics” and “mathematical sciences” are often used interchangeably. On the first afternoon of the workshop, each of the scientists gave a brief description of their own field. The second day consisted of a general discussion session and a breakout session in the morning, followed by a reporting session and another general discussion session in the afternoon. A general discussion period occurred on the final morning, focused on the outline of the report. International developments; i.e., a critical comparison of mathematics in the US and around the world. The participants surveyed the infrastructure needs of mathematics and found areas in which the current infrastructure is strong and healthy, and areas in which the infrastructure needs to be strengthened. The participants also found that mathematics in the US is still very strong relative to the rest of the world, but significant international advantages have developed in some key areas.